Informational pickets and other actions by UPTE-CWA researchers and techs as well as CNA nurses got underway Friday at many UC campuses, in the wake of both unions’ strike authorization votes. The Orange County Register reported that both UPTE and CNA members have authorized a strike, should it become necessary, over pay and pension issues. CBS Bay Area reports that members of a third UC union, AFSCME 3299, representing service and patient care workers, also authorized a strike. 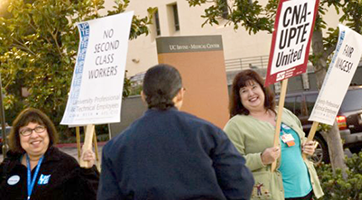 Meanwhile, outreach to new UC president Janet Napolitano by the unions is moving in the right direction: UPTE and UC have signed a joint statement that they will be back at the bargaining table in an effort settle outstanding issues. Napolitano herself is outlining her vision for UC after a month-long tour of the campuses, reports the San Francisco Chronicle and Inside Higher Ed. That includes committing $5 million in funding to undocumented UC students, according to the Los Angeles Times, even though recent appearances by Napolitano haven’t been without protests from immigration activists. The past two decades have seen a great increase in the so-called “freeway flyers” in the academic world: part-time faculty who work for few or no benefits and who must dash from part-time job to part-time job in order to make ends meet, as the Monday Memo has reported earlier. Now the Boston Globe reports on a number of efforts of part-time faculty to unionize. To see the fight for fair pensions at UC in a larger context, read Matt Taibbi’s piece about Wall Streets looting of public pensions in Rolling Stone.